Last week I left off at the beginning of the framing stage of the house. I've got loads of pics of this stage, but even as I look through them, sometimes it's hard for me to make sense of what I'm actually seeing. It's all just a bunch of 2x4's with no walls and it gets confusing even though I know the plan! That said, I think I'll mostly just show you what it looks like now, and try to explain what's in each photo. 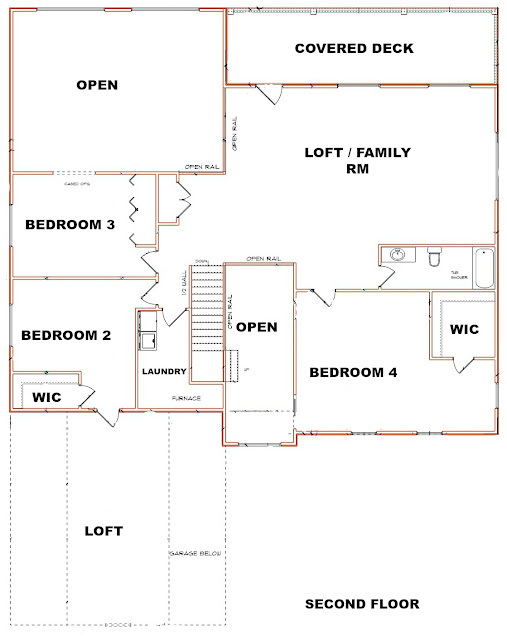 Let's start with a reminder of the floor plan. That should help all these open walls and 2x4's make a bit more sense. This is the view just after you've stepped in the front door. (Not that I've ever done that, since there's about a 4 foot drop out the front door right now. But you get the drift.) Our master bedroom is the room straight ahead, then obviously stairs to the 2nd floor. If you turn around and stand in front of our bedroom, you can see the full entryway. The area above the door allows us to have a covered porch, but leaves a landing of sorts above the door. To the left of that upper window, you can see there is metal instead of wood. (Seen much better in the pic below.) That frames out what will be a pocket door which will allow us access to that landing without using a ladder. This was a change from the original plan, but I just couldn't see carting a Christmas Tree up a ladder every year (the space so desperately calls for one doesn't it?!) when we could just walk it in through an open door. And the view when you're standing on said landing. It's a place for us to drop all our stuff and make a general disaster of everything. (Speaking from experience here as we already have an area just like this in our current home.) But hey, at least we'll know where our jackets are. Backing up just a bit, you can see the same area, on the left, as it relates to the staircase. The locker area I just showed you is now just to the right. This is the view when you've come in from the front garage and can see all the way to the back of the house. 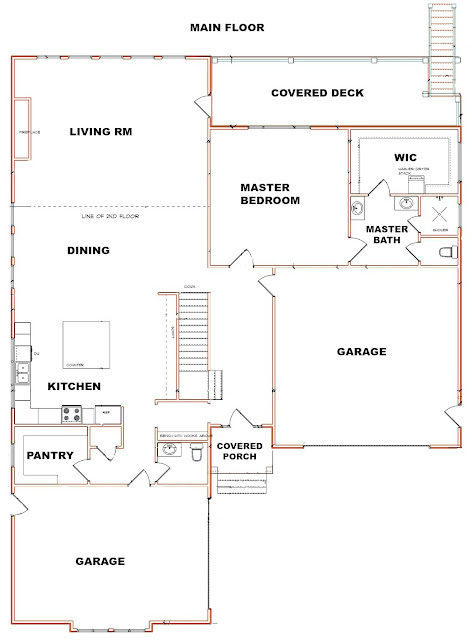 This encompasses the kitchen, dining and living area. If you walk forward just a bit and turn to the left, you come to the next photo. This space is very underwhelming right now, but eventually it should be my favorite spot. Below that center window will be my farmhouse sink. On the wall to the left is where the stove and refrigerator will sit. Those same windows, now on the right, but seeing them from the dining area. The stove and fridge will be straight ahead with the sink and dishwasher to the right. We plan to put a big island in the center here, and that area on the left will be cabinets and a coffee bar. 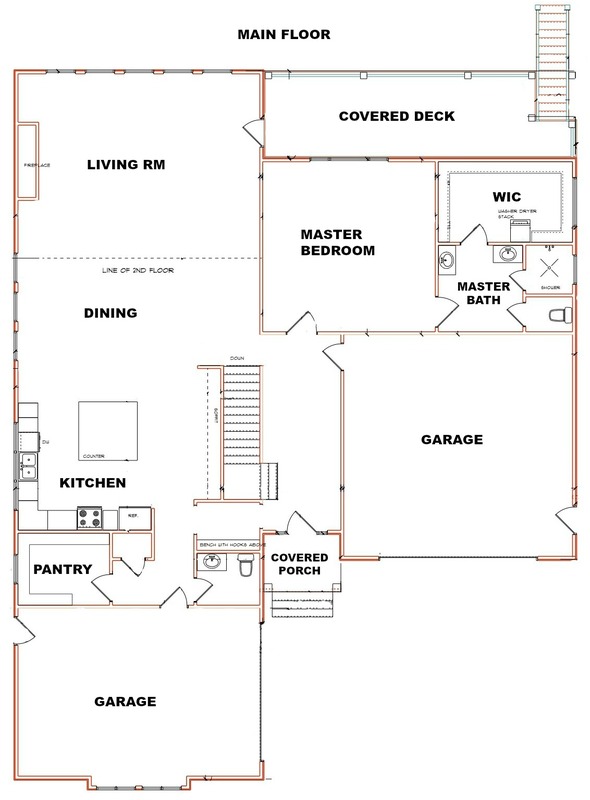 For you all who are very visual like me, here's a bit of an example of some of the basic layout. 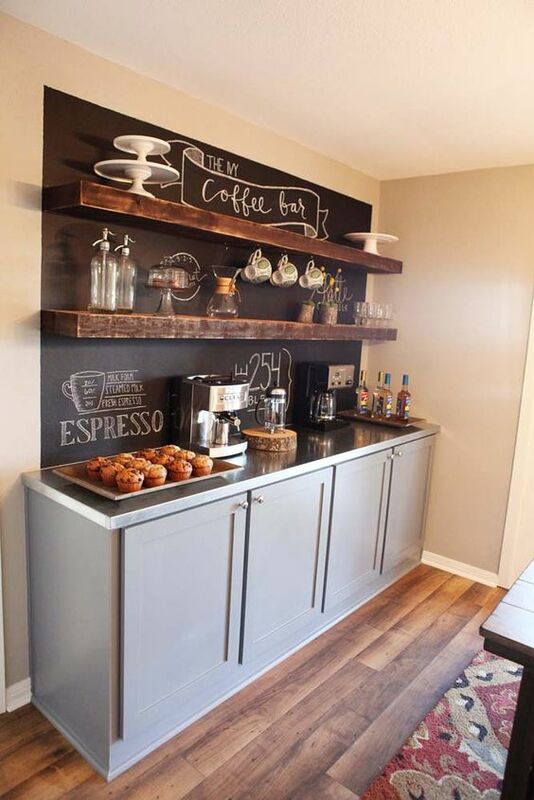 And here's a very loose example of what the coffee bar might look like. Also the coffee bar area seen here, as well as stairs to the basement. And if you walk through the opening to the left of the stairs, you've come full circle to the front entry. 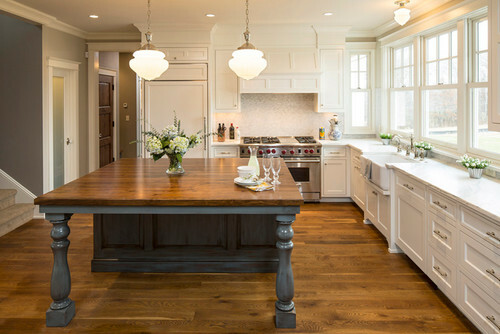 Alrighty, if I had that big island in the kitchen already, I think I'd be standing on it. So what you're seeing here is the dining area and living room. Our table will sit perpendicular to those 3 tall windows on the right. One of the huge draws about this house for me is the ability to put the dining table out in the open and have nothing impeding anyone who wants to sit down from any direction. No more asking people to stand up or skooch over so someone can get to their seat. Hooray!! Past the open area you see a bunch of supports. (there's a better angle below) The living room is open to the second floor, so the framers built this scaffolding to access everything above the main level. The fireplace is on the left, and the door back on the right leads to the deck. And looking straight up in the living room, here's the basics for a coffered ceiling. That's about it for the main level I'll show more details of the bedroom, etc. when it's all a bit more interesting. For now, on to the basement. The view below is just after you've come down the stairs, which are to the left in the photo. This is the only area that is actually getting finished down here. The bathroom and one bedroom. In the middle, just behind the post, is the same hall to the bedroom. To the right of the post is the hall that leads back to the stairs, and the door on the right is to the area under the stairs. This fun little room hidden back in the storage/utility room is what I'm calling the pet room. It's basically just a small space with a drain and sunken floor. Baths, puppy crating while we're gone, cats that can't be left unattended while we're away cuz they pee on my couch... No, they won't be in here all the time, and certainly not together. But it's just nice to know there's an easily cleanable area if we happen to need it for our animals. Some day I'll show you all the safe room, but without electricity, it truly is a black hole in there. You've already seen this view from the top of the stairs. Well if you turn around from here, it's the pic below. This will serve as our family room. We envision a big comfy sofa nestled somewhere under those two windows, with the TV on the opposite wall. The wall to the right with the plumbing coming out of it, that's the TV wall. The area closer to me may have a pool table, it may be a card table, we just aren't sure yet what will be there. All we know is this is our hang out loft. Just a place to relax and enjoy ourselves. I call it a loft, because if you were to turn just to the left from the last photo, you see this. Someday there'll be a railing, but here's the opening to the living room below. In this pic, for perspective, those windows down below are the dining room windows, and the fireplace rough-in is in the top right of the pic. And backing up into that loft area, you see the opening to the stairs we just came up. 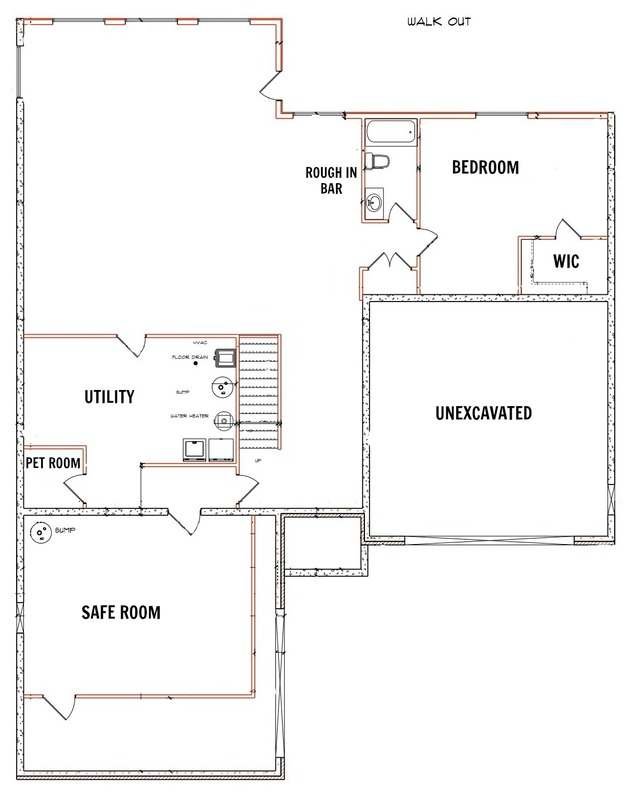 On the right is a linen closet and a hallway to the utility/laundry room, two bedrooms and the real loft area. And to the left is another bedroom and the bathroom we saw plumbing sticking out of a few pics back. Lastly, the real loft. The first pic I started with today is the loft. It's above the front garage, and is accessed from our oldest daughter's room. The view looking back into her room. I realize this hasn't been a comprehensive walk through of the house, but I'm hoping having the plans to look at will make understanding the layout a bit easier. This is where the house sits today. We had a walk through yesterday with the insulation guy, which means electrical, plumbing and heating and air are just almost completed. We're hoping we'll get siding soon, cuz with the rain we've had in the past few days we're getting flooded. Yes, even with windows in, the rain came pouring in. Oops! The powers-that-be do assure me though, that the siding will cure all. Here's to hoping. I'll leave you with the back/side of the house, as I realize I didn't show it yet in all it's black glory. Enjoy your day, and thanks for tagging along as we navigate this huge undertaking!